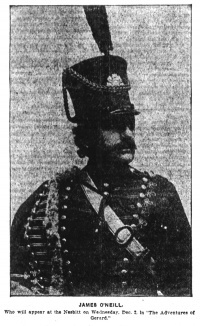 James O'Neill as Captain Gerard. 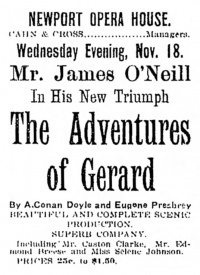 The Adventures of Gerard is a 3-acts American play, written by Arthur Conan Doyle and adapted by Eugene W. Presbrey, produced by Liebler & Co., premiered at the Smith's Theatre (Bridgeport, CT, USA) on 9 november 1903, then toured in several towns and states until (around) 15 january 1904 (see performances), starring James O'Neill (often mispelled O'Neil in the newspapers) as Captain (sic) Gerard. 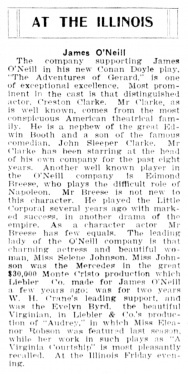 Note that Conan Doyle's play was performeed in USA (1903) before UK (1905). 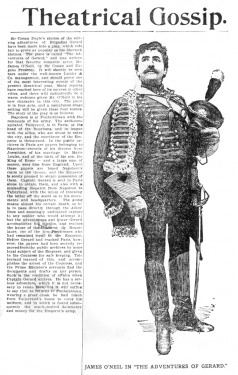 See a 1905 interview of Arthur Conan Doyle in The New-York Times about his difficulties to place his play to the London theatre managers : Conan Doyle's Hard Luck as a Playwright. 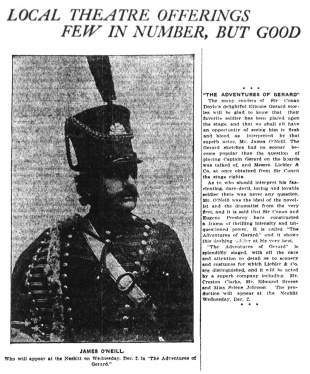 Last performance in Chicago between 11-14 january 1904. This page was last edited on 7 April 2018, at 21:01.